A hushed silence permeates throughout the room, only to be disrupted by a council member murmuring into their microphone. Walking into the council chamber of Palo Alto City Hall, one is greeted by rows of taupe couches, nine council members peering down at the crowd from behind an arc-shaped podium and a jumble of citizens exiting and entering the chamber. Idling in the back of the room are several residents with something to say. Among the congregation stands Peter Underhill, a resident of Palo Alto for the past 28 years and a researcher at Stanford University, who waits to voice his concern about three large homes simultaneously being built around his small cottage. Known as a college-town-turned-suburb and a cutting-edge hub for creation, innovation and technology, Palo Alto’s perks are also the sources of its problems. In particular, a housing shortage, sky-high prices and congested traffic cause concern among its citizens. The Comprehensive Plan, Palo Alto’s land-use guidebook that incorporates citizen committee views and has been in the works for nearly a decade. Several key components of the plan were omitted on 5-4 votes by the City Council during a January meeting. Following a notable council election and the recent controversial modifications to the Comprehensive Plan, the trajectory of Palo Alto’s future growth is shifting. As Palo Altans approach the crossroads of their city’s future, they are faced with the question — to grow or not to grow. Nestled in the Green Acres neighborhood, between apartment complexes and the remnants of an orchard, lies a site that resurrected a long-standing dispute. 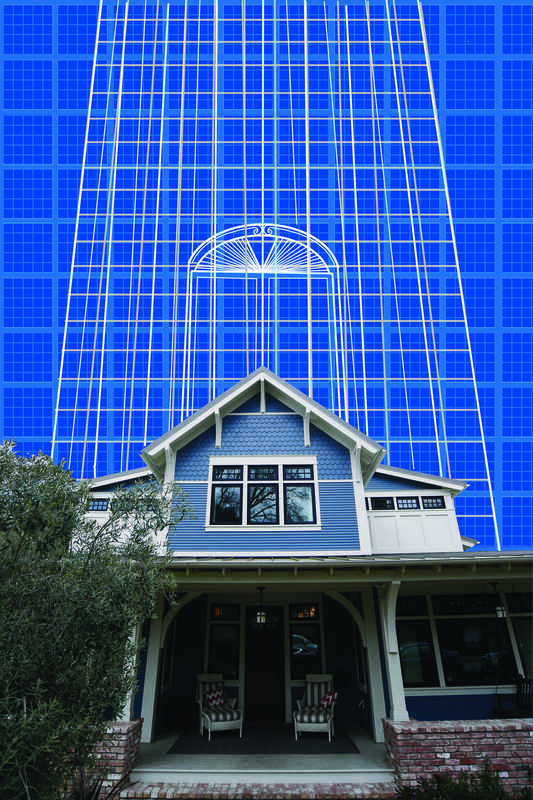 The largely-residential plot was to hold 60 units of affordable senior housing and 12 single family units, but controversy resulted in the 2013 creation of Measure D. If passed, the ballot would shift the zoning of Palo Alto from low-density to high-density. Proponents of the measure argued that these housing units were necessary to provide the elderly with affordable housing. Opponents argued that the city’s traffic would become congested, quality of life would suffer and developers would take advantage of the situation and create dense, for-profit market-rate housing. By a margin of 13 percent, the proposition was denied, halting the development and maintaining Palo Alto’s limitations on zoning. After the debate regarding Measure D, a political action committee calling for slower development was formed. Focused on maintaining Palo Alto’s current status as a residential suburb and ensuring that transportation doesn’t become congested, Palo Alto for Sensible Zoning advocates that housing should remain low density and that development should focus on housing. Many advocates of slower growth, known as “residentialists,” share a common sentiment — for Palo Alto to retain its intimate, small-town charm. On the other side of the debate is Palo Alto Forward, a non-profit organization, advocating for more development to address the problem of transportation, with solutions such as creating more local housing, allowing people to access their work spaces easier. To maintain Palo Alto’s vibrant economy and community, PAF says more housing and development is necessary. Following a notable council election, the 2016 city council election has swung the majority to pro-growth. New council members play a crucial role in the future of Palo Alto growth. Lydia Kou is one of the recently-elected council members who advocates for regulated growth. A long-time organizer of community preparedness events and groups. Kou says she is ‘for the residents’ and is associated with PASZ. Kou campaigned against extra development of office spaces in Palo Alto, saying that focusing on the building of schools, affordable homes and transportation will help solve the housing problems. Kou says she is not a proponent of no-growth. Adrian Fine, another new council member, advocates improving housing and transportation issues through an increase of development. More flexible to growth, Fine says Palo Alto needs to adapt to change and will eventually transition into a “mid-urban” community over the course of the century. Through developing commercial areas, Palo Alto can adapt for growth while preserving its culture of innovation. Opinions on local development vary across neighborhoods and people. Transportation access, parking in neighborhoods and types of zoning all serve as points of discord. Demographic and economic changes have resulted in polarization over these issues, and residents hold firm stances. Others, however, welcome development as a means of solving issues of housing and transportation. Most citizens share the same goals — increase affordable housing, improve traffic, maintain a robust economy and manage growth. Citizen approval of zoning, dictating types of development in a given area, has been decreasing, dropping to 38.3 percent, according to the National Citizen Survey for the City of Palo Alto. The ability to find affordable quality housing has followed a similar trend, dropping to 8.2 percent, which is why it remains a priority of the city council. While the concern about transportation and housing is shared, most Palo Altans, off and on the council, agree that some degree of regulations are necessary. The debate over development stems from means, not motivation. At the end of the day, most citizens of Palo Alto share the belief that development should benefit the people.